Bocas Marina combines an awesome tropical setting with ease of access and reputable service into a complete package. 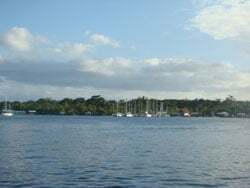 Conveniently located across from Bocas Town, Bocas Marina has room at its floating docks for up to 100 boats, with a maximum length of 120 feet. This popular cruiser’s destination combines an awesome tropical setting with ease of access and reputable service into a complete package. Each slip has metered electric service and free water, and boaters have use of a bath house. The dockside restaurant and bar host occasional special events (I’ve heard the Halloween party is a hoot!). Laundry and Internet services are also available. 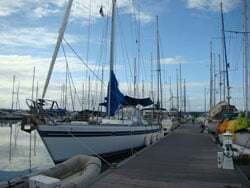 Bocas Marina offers on-site boat repairs and basic maintenance and has a diesel fuel dock. More specialized yacht services can be arranged through the marina with local craftsmen. For haul-outs they refer boaters to a recently-built boatyard at Almirante, on the mainland, called Bocas Yacht Services. For those interested in buying or selling a boat they also have a brokerage with sail and power boat listings. 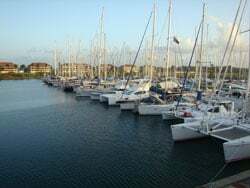 The advantage of docking at Bocas Marina is its proximity to town, so provisioning is a bit easier and you can enjoy the Bocas Town nightlife. Check here for more details. The Red Frog Marina has over 70 slips on floating docks that can accommodate boats of all sizes. Located on Isla Bastimentos, Red Frog Marina is part of the larger Red Frog Beach Island Resort and Spa. This is a multi-use property with private residential villas, two restaurants, a full-service spa, a hostel and a range of leisure activities on site. One of its nicest features is a picture-perfect crescent of white-sand beach that you don’t want to miss. It is reachable only by water and the marina provides regular water taxi service to Bocas Town for its guests. The marina has over 70 slips on floating docks that can accommodate boats of all sizes. Approach to the marina is along the south shore of Isla Bastimentos with depths of 16 to 30 feet. In addition to short-term slip rentals, they offer a number of slips for purchase. Electricity and water are metered at each slip, and boaters are welcome to use the bath house and laundry room. While they don’t have a boatyard or haul-out facilities, they do offer a wide range of repair work, installation and trouble-shooting of all the main boat systems. Red Frog Marina is a good choice for nature-lovers and those who prefer the peace and quiet of being away from town. Surrounded by lush jungle and tropical flora and fauna, Shelter Bay Marina’s location is gorgeous. At the northern entrance to the Panama Canal you’ll find the Shelter Bay Marina complex. This full service marina and boat yard has it all. The property is located at Fort Sherman, a former U.S. military installation now in disuse. It is on the western side of the Gatun Locks and several miles outside of the city of Colon, so by road it’s a bit out of the way. The marina does offer shuttle van service into Colon for shopping and other needs, and taxis can be arranged as well. The marina location is gorgeous, surrounded by lush jungle and tropical flora and fauna. It is very well protected, being inside the canal breakwater and completely enclosed, so forget about wind, waves and wakes! This large marina has over 200 boat slips and can accommodate all sizes. They have all the dockside services we have come to expect. Shore-side the amenities are extensive, including a hotel, restaurant, chandlery, swimming pool, exercise room, and a well-stocked store that offers a variety of personalized services. Adjacent to the marina is the boatyard with complete haul-out facilities, fuel delivery, work area, and boat care available. Shelter Bay Marina is the only full service facility at the north end of the canal. If you plan to transit the canal this is an excellent place to prepare for and await your trip. If you don’t plan a canal transit, it’s a great place for a stopover or to complete your boat projects. You’ll find details about Shelter Bay and all their rates here. 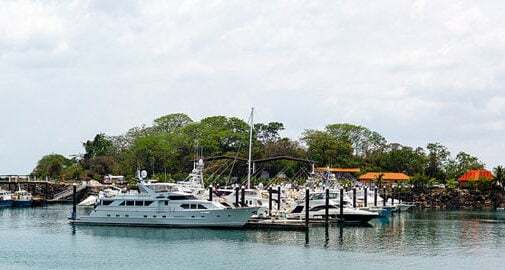 The Flamenco Yacht Club and Marina is the perfect place to dock and explore Panama City. Whether you are doing serious provisioning, completing a canal transit, or just want to hang out near the big city lights, Flamenco Yacht Club and Marina is the place to dock in Panama City. In fact, it’s the only full service marina in the city that caters to small boats. Flamenco Marina is positioned at the end of the Amador Causeway, snug between Isla Perico and Isla Flamenco, with a clear approach and two long breakwaters. They have 191 slips, all with water and electric service, for boats up to 250 feet. Amenities include a restaurant and bar, showers, laundry, Internet, store and game room, as well as a fuel dock with gasoline and diesel. Alongside the docks you’ll find a large haul-out and storage yard with a travel lift, where they offer a range of maintenance and repair services. The slip rates at Flamenco Marina are higher than other locations, probably due to the lack of competition. Still it’s an awesome location and perfect for exploring Panama City. You can find more details here.